With the upcoming Samsung Galaxy S7 set to be unveiled on February 21st at MWC 2016 in Barcelona, it's time for the year-old Galaxy S6 to be offered at discounted prices. As such, it comes of no real surprise to learn that Amazon is now selling the 32GB Samsung Galaxy S6 starting at $450 unlocked, or about $50 lower than the usual retail price of the handset. Depending on the color you're after, the handset will set you back anywhere between $450 and $470. The Black Sapphire Samsung Galaxy S6 model is priced at $450, the white model costs $456, the gold model is priced at $458, while the Blue Topaz model will set you back $470. If need be mentioned, these handsets are compatible with T-Mobile and AT&T, but will not work on Verizon or Sprint. Although it's nearing its first anniversary, the Samsung Galaxy S6 is still one of the best Android smartphones money can currently buy. Most of you probably know a great deal about Samsung's 2016 flagship smartphone, but just in case you need a refresher, here's a short recap. 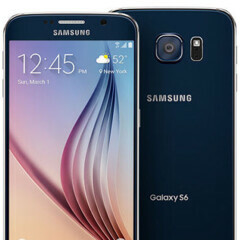 The Galaxy S6 comes with hardware specs that include a 5.1-inch Super AMOLED display running at a resolution of 1440 by 2560 pixels, an octa-core Exynos 7420 chipset (the fastest chip in the Android camp throughout 2015) paired with 3GB of RAM, a 16MP primary camera, a 5MP secondary shooter, and a 2550mAh battery. For a much closer look at the handset, check out our detailed Samsung Galaxy S6 review. What do you guys think of this deal? Will you jump on it, or are you waiting for the upcoming Samsung Galaxy S7? Great deal. To bad no Samsung Pay on it. It has a Samsung Pay ! It does not have Samsung Pay on it. It is the international version. Only the carrier versions have Samsung Pay on it. i trades in my S5 for the S6, and the poor battery life bothers me on the S6. It's not w worth update （I would not use the word, upgrade）. By the way, I also got the Galaxy Tab S2. Samsung has the very poor strategies and decision making for year 2015. It has a small internal battery, no storage space and is locked down with Knox. Does anyone still want these phones? I'm perfectly happy with mine, though I do wish the battery was a bit bigger. It doesn't bother me too much since my S6 is mostly my work phone, so I don't really use it for any battery draining stuff like videos. In fact, the S6 and most Samsung flagships are very efficient at playing videos and YouTube! You can easily get over 6h sot if you just watch videos! It's browsing and camera which eat battery! $40 more buys you the much better Nexus 6P or the 64GB Moto X. I don't see anything from Samsung being a good deal. Any sane person would buy S6 now over A series 2016 phones. If you are on AT&T get the S6 active(or do T-Mo with an unlocked one). The battery is larger and it is waterproof too! I love mine. These are not North America variants and are without warranty, thus useless to me. Another ridiculous article of PA.
Hi, The phone comes with one year of warranty and is fully compatible with T-Mobile and AT&T. The price drop for this device is incredible.. By the time I decide to sell it(in next few months), I'll have to agree on $10.. Bought it $700 back in May!